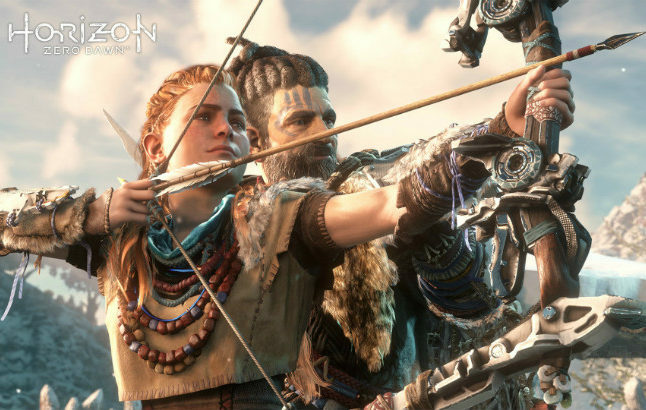 Aloy and Rost practice archery in Horizon Zero Dawn. Credit©2017 Sony Interactive Entertainment Europe Limited. 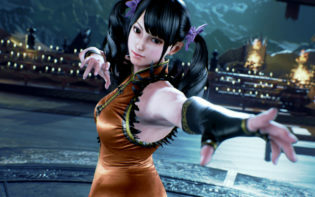 All content, games titles, trade names and or trade dress, trademarks, artwork and associated imagery are trademarks and or copyright material of their respective owners. All rights reserved. European development company Guerrilla Games are a subsidiary of Sony Computer Entertainment and over the years they have worked closely to release captivating for PlayStation owners. With their origin in 2000, Guerrilla Games have gradually established a portfolio of releases, each new release presenting new mechanics, worlds to explore and experiences to have. 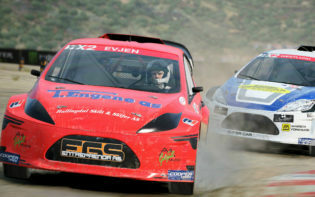 Since the studio began releasing games, they have garnered several awards as each title aims to expand boundaries within interactive entertainment a little further. To date, Guerrilla Games currently employs over 200 professionals from across 25 different nationalities, located in Amsterdam, The Netherlands. With their diverse team of talented individuals, Guerrilla Games aim to channel their creativity into a new project, an open-world game, a first for the studio. The European studio enters the limelight to announce their newest project, Horizon: Zero Dawn. With Horizon: Zero Dawn Guerrilla Games aim to produce a vibrant world set in the distant future; rich with activity and inhabited by strange creatures, Horizon: Zero Dawn aims to present a unique landscape for players to immerse themselves within. The strange creatures which roam the world Guerrilla Games have created seem to resemble mechanised dinosaurs made from sophisticated machinery. 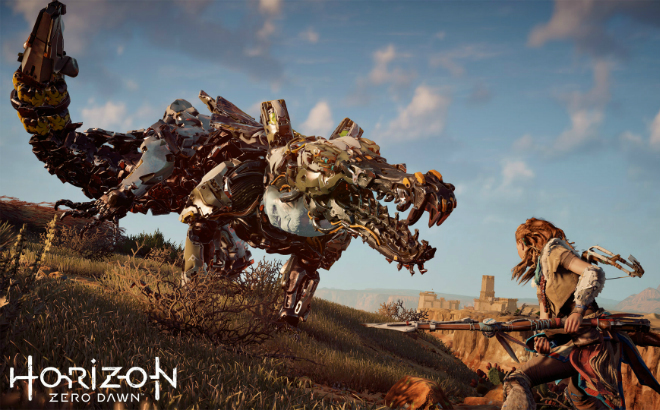 The overgrown world of Horizon: Zero Dawn seems to be populated by mechanised beasts who roam environments which may faintly resemble the world as it is today. Set in a world 1000 years in the future, the visible ruins seem to indicated the last remnants if a past civilisation. Guerrilla Games have set out to create an intriguing world with Horizon: Zero Dawn, one with filled with a mystery past where player gradually unravel secrets as they play. Aloy explores the vast open-world landscape of Horizon Zero Dawn. Credit©2017 Sony Interactive Entertainment Europe Limited. 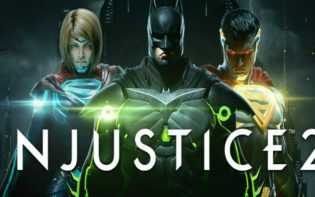 All content, games titles, trade names and or trade dress, trademarks, artwork and associated imagery are trademarks and or copyright material of their respective owners. All rights reserved. The protagonist of this story is a young hunter named Aloy who is on a journey to discover her destiny and uncover the secrets this world holds. As Aloy explores environments reclaimed by nature, she may also encounter pockets of humanity which live on in primitive tribes. With the aid of her companion Rost, Aloy taught to wield a bow and arrow to hunt to survive in the unpredictable environments which surround her. Players follow Aloy’s story as she learns new skills and perfects techniques to survive the world Guerrilla Games have created. As Aloy explores this world which civilisation once knew, unanswered questions about her past compel her to search for the truth. As players learn more about Aloy and the world she inhabits, many of the secrets buried beneath the surface may soon come to light. Using her agility and skill, Aloy may encounter a variety of mechanical creatures as she attempts to untangle the origins of this strange world. The world of Horizon Zero Dawn is inhabited by mechanised beasts which Aloy encounters on her journey. Credit©2017 Sony Interactive Entertainment Europe Limited. 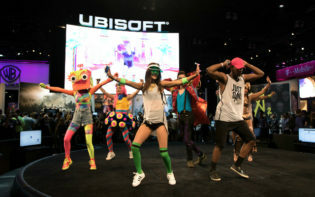 All content, games titles, trade names and or trade dress, trademarks, artwork and associated imagery are trademarks and or copyright material of their respective owners. All rights reserved. In a world packed with collectibles, new locations and secrets to uncover, Guerrilla Games aims to prove a rich environment for players to explore. 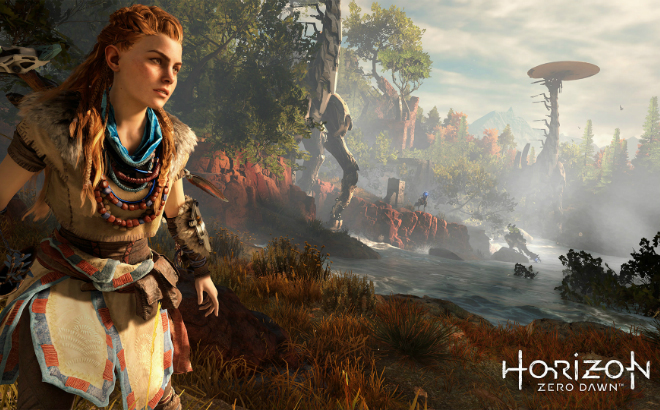 Players may find themselves moved by Aloy, enamoured by this peculiar open-world or striving to improve their abilities in this interactive landscape. Horizon: Zero Dawn aims to present players with a multitude of activities to captivate those who step into Aloy’s world. Whether harnessing the technology of a technologically-overrun world or getting to know Aloy and progressing her narrative, Guerrilla Games aim to craft an immersive world which players may experience at their leisure. Horizon: Zero Dawn seems to be filled with unexpected moments, characters and dynamic mechanised creatures as Guerrilla Games aims to create a living world which may captivate players. Horizon Zero Dawn aims to release on PS4 and PS4 Pro in the UK on 1st March 2017. How do Guerrilla Games aim to present a fresh experience with Horizon Zero Dawn?